The arrival of October means Halloween is just around the corner. 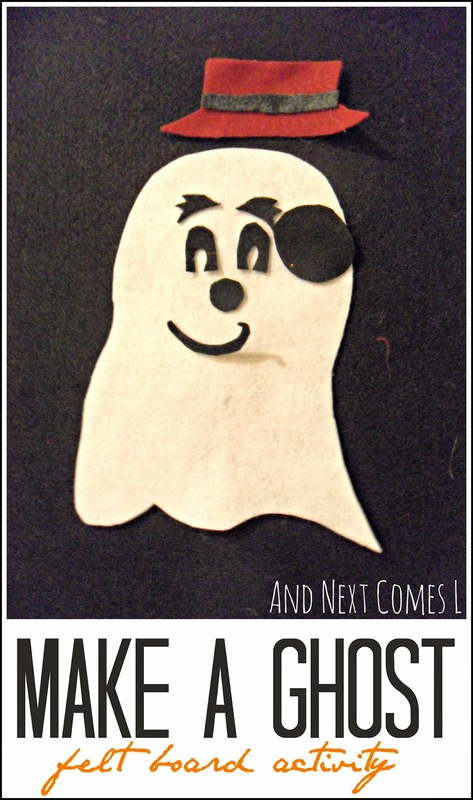 We've been doing a few Halloween inspired activities already, including a ghost busy bag, a light table spiderwebs activity, and a ghost sensory bin, but I was hoping to come up with something fun for the felt board. I've seen lots of jack-o-lantern felt board activities before, so I decided to go with ghosts. Mix and match ghosts. I particularly enjoy watching the boys' creativity blossom with mix and match felt board activities like monsters or owls, so I had to make this ghost set in a similar manner. I cut out two white ghost shapes and various black pieces, including eyes, mouths, and eyebrows. Some of the pieces can work as eyes or eyebrows, while others can work as eyes, mouths, or noses. Regardless, there's lots of room for creativity. I stuck up the two ghost bodies onto the felt board one evening to see what the boys would create. They started making adorable little ghosts, but they wanted something more to add to their ghosts. Well, luckily, the accessories from the dinosaur dress up play set worked perfectly for the ghosts, which lead to some ghosts wearing hats.